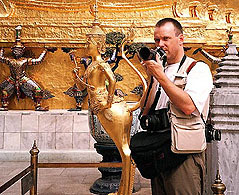 Since 1988, Bryan has photographed in the following countries:- INDIA, NEPAL, MADAGASCAR, ICELAND, TURKEY, CHILE, ARGENTINA, BRAZIL, THAILAND, MYANMAR (BURMA), LAOS, CAMBODIA, VIETNAM, MALAYSIA, SINGAPORE, INDONESIA (JAVA & BALI) & VENEZUELA (LOS ROQUES). Part of this work has been submitted to "Tony Stone Worldwide - Getty Images" a photo library with headquarters in London. The rest is used for other publicity purposes and exhibitions. See the reportage photos below. In November 1998, Bryan won two awards, one national and one international, for a poster produced together with the printing company 'Maredi'. VIII Awards 'Fernando Pini', ABIGRAF, FIRST PRIZE in the category 'Posters'. V Competition Graphic Products for Latin America 'Theobaldo de Negris', FIRST PRIZE in the category 'Posters'.